Happy holidays! We had a good Christmas here; I hope you are having a good holiday season, no matter what you celebrate. 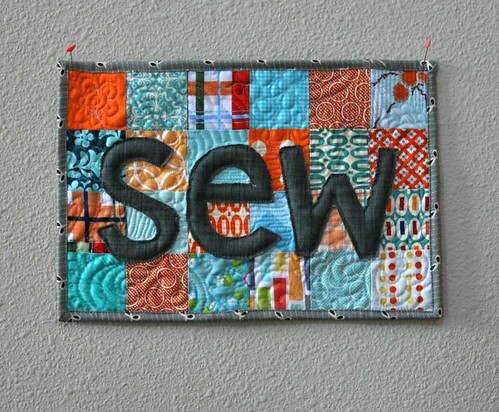 I have been busy with sewing and life and not making time for blogging. Here's the start of some blog catch up. 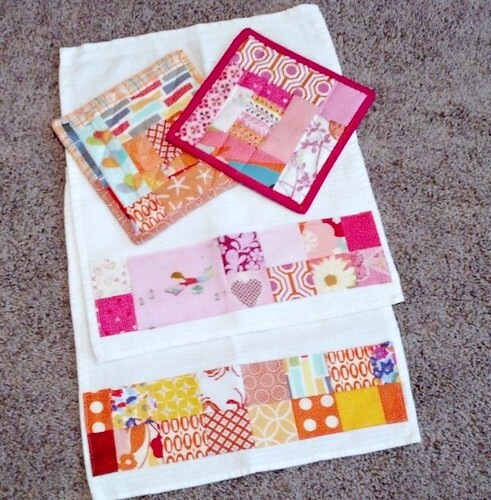 I made potholder/kitchen towel sets for my sisters this year. I have 5 siblings and we have a rotation of which sibling we give to each year. 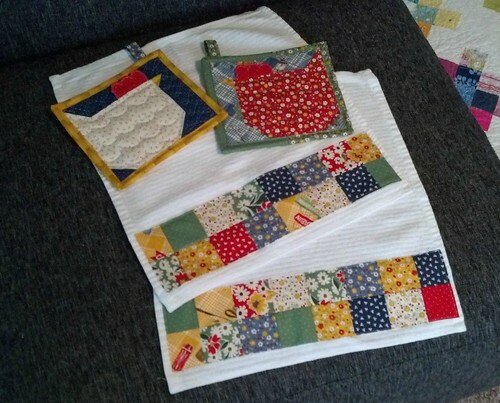 Last year I didn't make a handmade item for my younger sister, so this year I made potholders and patchwork towels for both of them. Chicken potholders and matching towels for my sister who owns chickens. The chicken block tutorial is here. 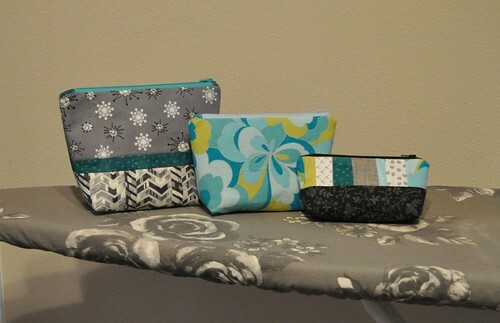 I use one layer of heat resistant batting and one layer of cotton batting for my potholders. Pink and orange scrappy set for my other sister. I decided to use decorative stitches to sew the binding down on these potholders and it didn't end up looking as good as the straight stitch I usually do. 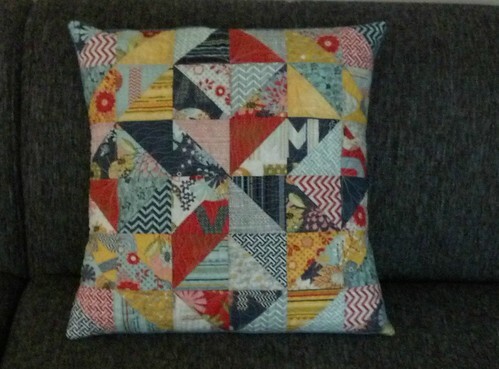 And a half square triangle pillow I made for my mom. I have a similar pillow on my couch and Mom really liked it when she visited this past summer. I had this one languishing in a UFO state and decided to finish it up and send it to her. I'm interested in experimenting more with value and HSTs one of these days. A couple weeks ago, we had the holiday party for Seattle MQG. I made this SEW quilt. This is my first try at trapunto. It was really easy and you should try it! I sometimes avoid trying new things and I'm glad I finally tried this technique because it was really no big deal. I can make up a mini tutorial on it if anybody is interested. And this is the gift I received. These beautiful nesting zip pouches were made by Ruth (I don't know her last name or have a blog or IG link for her, sorry!) It was fun when I opened the gift to unzip the big pouch and find the second one, and then to unzip that one and find the small one. The other thing I wanted to share is the beginning of the Christmas stockings I'm making for myself and my husband. Four years ago, I wrote up a tutorial for scrappy stockings on the Sew We Quilt (formerly Stash Manicure) blog. I had made these quilted stockings for my 3 kids but my husband and I have been using flannel stockings (with glitter on our names) that my mom made in 1996 when we got engaged 2 days before Christmas. I'm finally making matching stockings for us, even though Christmas is over for this year. The pattern I uploaded in 2010 is on Scribd and it was free to download at the time, but now you have to either pay money or upload a document in order to download something. 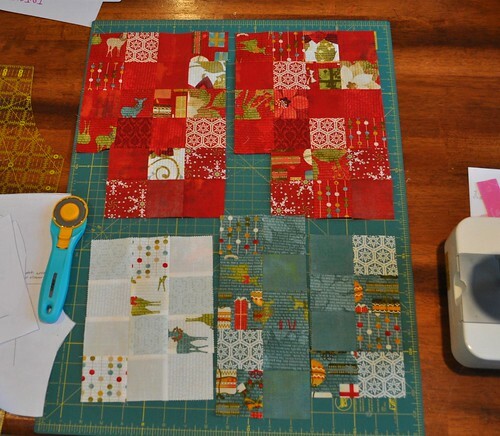 I uploaded my heart block tutorial (I'll share here soon) and was able to download my pattern. I think I will put the stocking pattern on Craftsy as a free download and hope to show more progress on these stockings in the next few days. Great projects, as always! 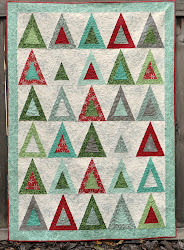 I particularly love the mini Sew trapunto quilt. Would love to see a tutorial if/when you have time.